In a large bowl combine the soup, half-and-half, tarragon and pepper. Stir in the spaghetti and the chicken. Transfer all to an ungreased 9x13 inch baking dish. Sprinkle with the Parmesan cheese and bake, uncovered, for 30 minutes or until heated through. I was looking for something to make because I had tarragon on hand, and this was simple and good! I love tarragon!!! This is really good. Very easy,too. I used fat free half & half and it turned out great. Might use just a little less pepper next time. Thanks for submitting! 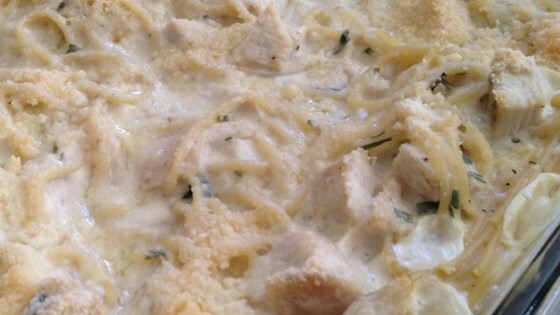 After reading some of the reviews, I made this recipe more as a sauce for chicken and pasta, and not as a casserole. The sauce tasted wonderful, but needed to be a little thicker.